Perfect as gift container for little crafty gifts for a fellow crafter or as container in a studio.And when the tea is long gone and the gift card spent, the mug and tray still do duty in a craft room to hold crayons and bits and bobs! 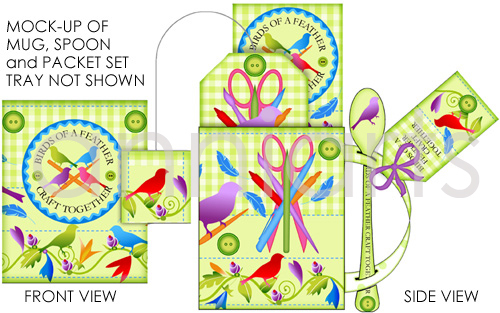 Craft Equipment and Crafty Birds on this pretty spring green 3D Mug, Spoon, Tray and Packet set. A glue stick, eraser, sharpener, markers, small scissors etc. will fit into the mug nicely. Plus tea for craft inspiration in the tea bag packet of course. Optional gift card envelope from a craft store is great as a voucher for a crafty birthday gift. A bonus presentation tray can even contain an additional little gift wrapped in the extra patterned paper. There are lots of small crafty gifts that can be wrapped - like stamps, ink, glitter, punches etc. Do you like the Crafty Birdies items? Should I add items? Scroll down to comment !